When you display your data in a chart, there is usually an unsaid assumption that viewers are somewhat familiar with the data. 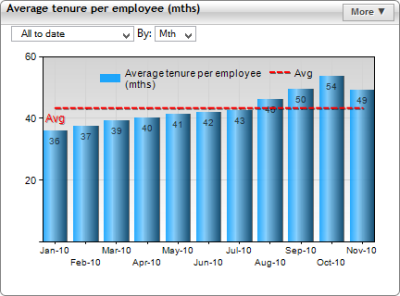 Charts make it easy for virtually anyone to view trends or compare values, but sometimes new colleagues need to analyse their KPIs in more detail than just the quantity and direction of the metrics. The point of statistical lines is not to give users yet another metric to follow. Instead, it provides a benchmark that you can easily compare with your actual KPIs. 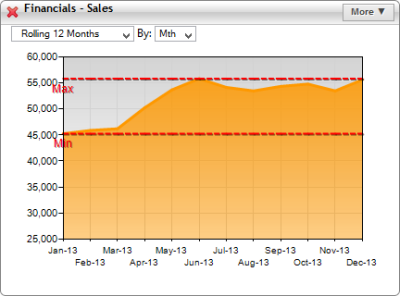 As you can see in the above image, a straight line is drawn from a single value on the Y-axis, resulting in the chart being divided into two. 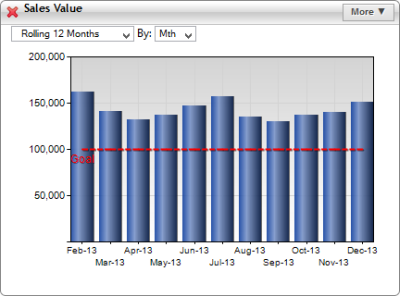 This lets you easily see where your KPIs have fallen below your displayed statistic. However, a stat line is only as useful as the statistic it displays. 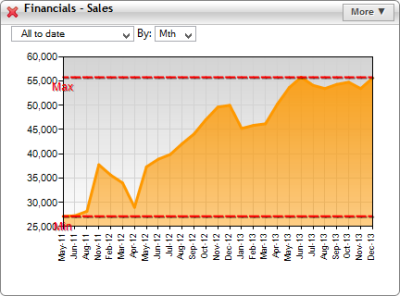 One of the more useful things to display alongside your KPIs (though it isn’t really a statistic) is a Goal Line. A goal line is (in this case) like a Target value, but it’s more informal; managers can set personal goals for KPIs, but not implement them as official targets. 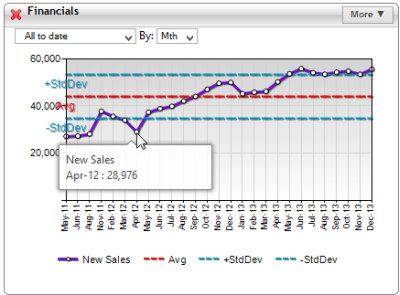 For Target Dashboard in particular, one reason you’d want to go with a goal line over a genuine Target is that goal lines can be added instantly to a chart, whereas Targets need data to be added before they can be displayed. 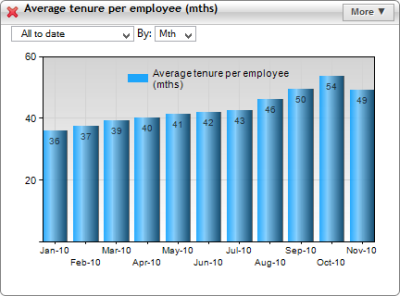 Imagine that you’ve created a KPI chart like the one below, displaying the average tenure per employee each month. In this case, it is very useful to compare each month’s costs to your average cost per month, since it can tell you if you’ve spent more or less than usual. 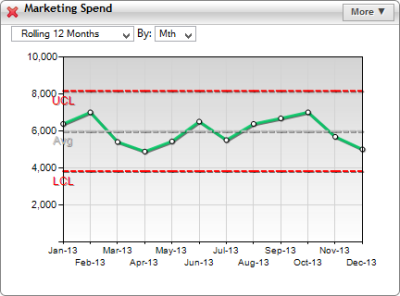 Average values complement targets, as they offer additional insight beyond whether you’ve made your target or not. A chart line is useful to me here because it lets me instantly compare any value on the chart with the lowest or highest occurring value. If you work for a company that employs 6 Sigma, you may already be familiar with the 6-Sigma Control Chart. For those of you who are unfamiliar with the six sigma method, the control chart helps organisations see that their processes and other KPI values are always within an acceptable range from the average of your values. One of the main goals of Six Sigma is to ensure that the performance of your metrics almost never falls out with this range. The range is worked out using Standard Deviation. Anyone else trying desperately to remember High-school maths classes? Standard deviation is a really useful statistic to compare your KPIs to, as it basically shows how much your values should vary from the KPI average (read: expected) value. The Six Sigma Chart acceptable range is 3 Standard Deviations on either side of the average, as this is believed to be the range which around 99.73% of values should occur. 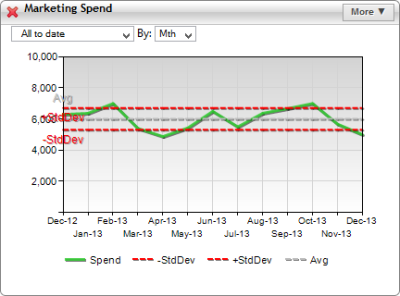 Though it’s incredibly useful for 6 Sigma practitioners, this chart is probably not for everyone. Since the vast majority of values fall within 3 standard deviations, it’s hard to see which values are good or bad. Therefore, it might be more appropriate to compare your KPI values to a range of 1 Standard Deviation from the average. Statistically, around 68% of your values will lie within 1 standard deviation of your average, making it a more useful tool for day-to-day use.